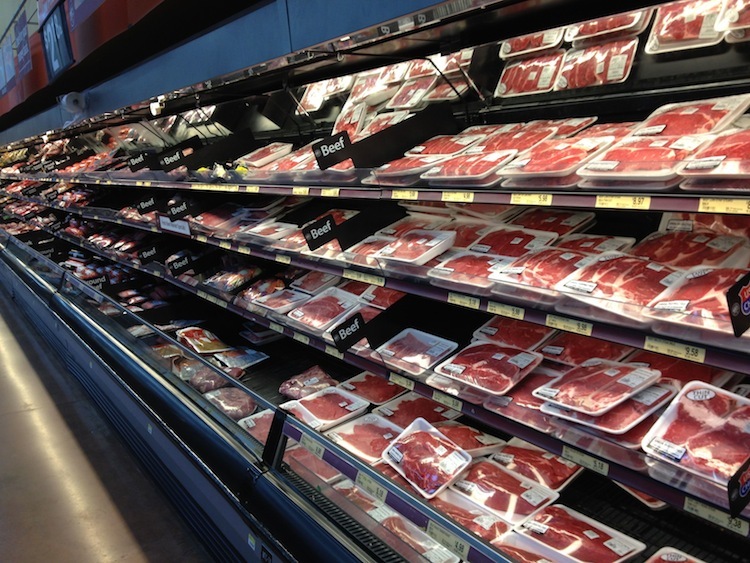 This week I wandered into the land of CAFO (concentrated animal feeding operation) or factory farmed meat at Walmart. I wanted to see if in the sea of packaged meat I could find anything that was grassfed, pasture raised or at least hormone and antibiotic free. What I found surprised me, though I doubt it will surprise anyone else . My local grocery chain, HEB carries quite a bit along these lines, even in stores that have very few organic products on the shelves. 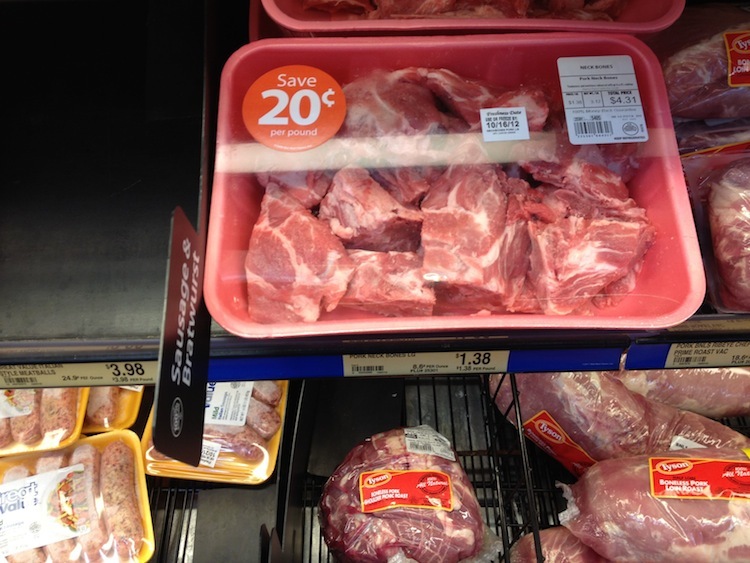 Walmart is falling behind in providing healthy meat choices. No grassfed or pastured choices at all. A little bit of hormone and antibiotic free chicken was pretty much it. Aside from the outrageously unhealthy and inhumane conditions in which these animals are raised, I am very concerned about the grains they are raised on. At this point most if not all factory farmed animals in the US eat large amounts of GMO corn and GMO soy. When we eat these foods, we are also eating what the animals ate. While all the animal foods at Walmart *looks* pretty much as Granny bought it, it is really a newfangled food. So it’s really important to transition from these compromise foods to real food choices as soon as you can. 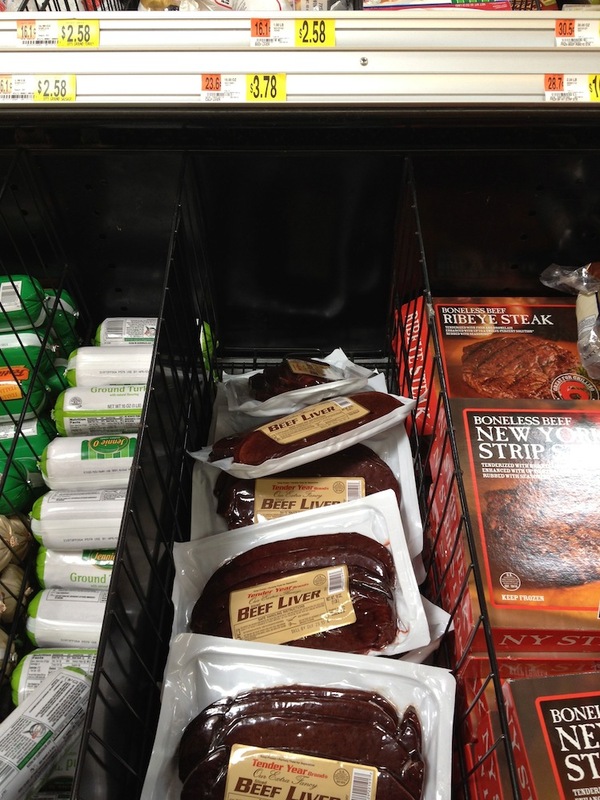 As you would expect with such a large meat department Walmart has lots of choices when it comes to cuts. All the usual choices can be found with a few unusual cuts thrown in. 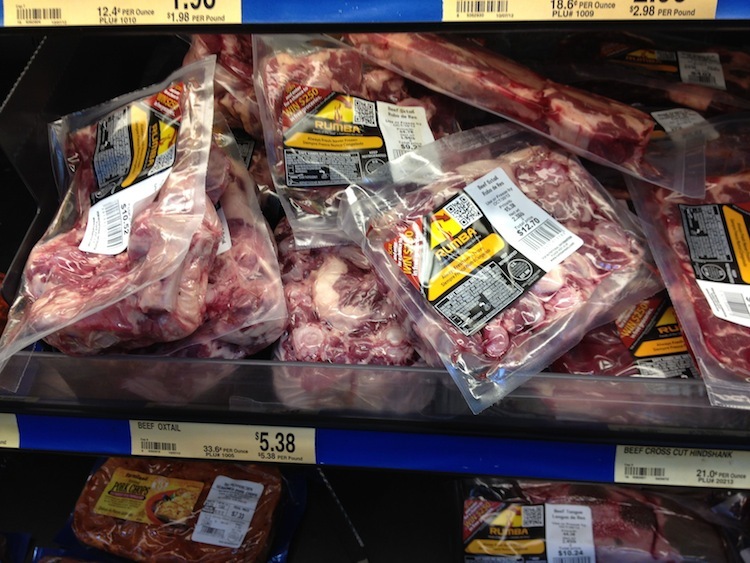 Walmart has a small stock of bones for broth making. I did find some feet and some oxtail. No soup bone packages though. This was a nice surprise! 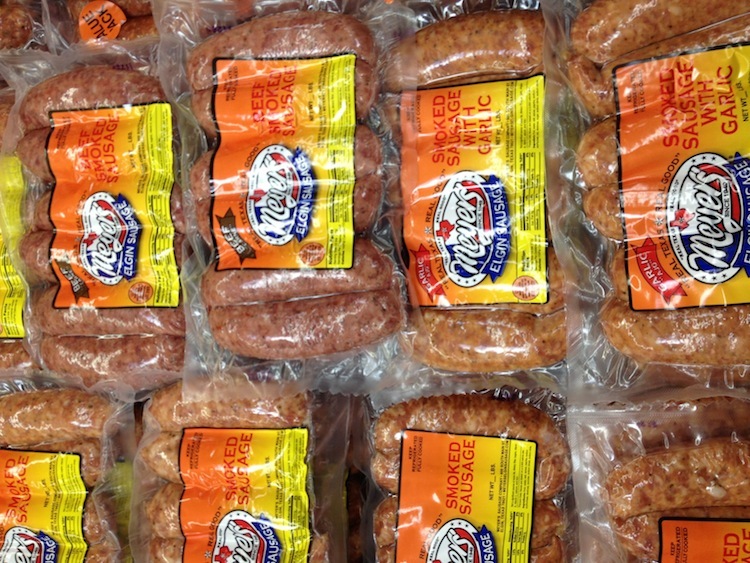 This sausage is made right here in my hometown, Elgin Texas. A reader had mentioned in a previous post that she found this brand mixed in with the Tyson chicken at Walmart. I stumbled across it at my Walmart too! I couldn’t find out any specifics on their feed so I’d assume it’s the usual stuff. They do however raise their birds without antibiotics and without cages, so that’s an improvement. 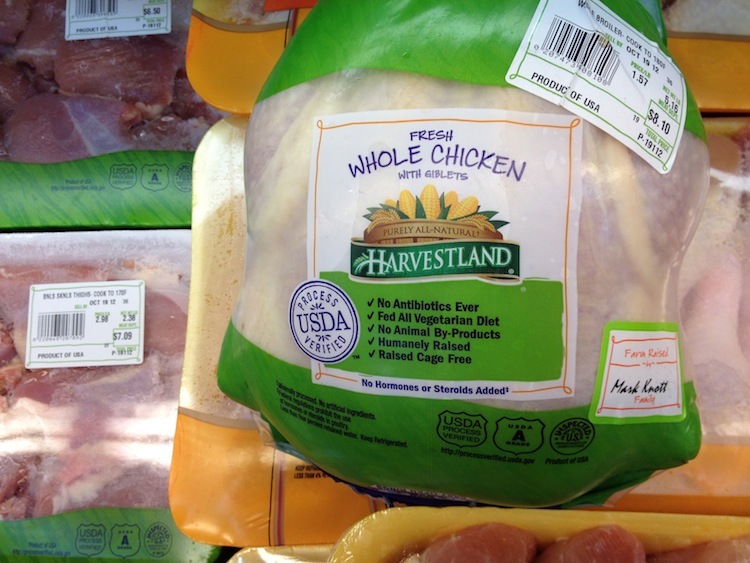 Antibiotic free chicken … Buy this whole and use the bones for broth. What if my family cannot transition to healthily raised animal foods soon? If you cannot transition to healthily raised animal foods soon consider reducing your use for awhile. Just how to go about it depends a lot on your individual situation. Family preferences are really going to come in to play when it comes to meat. Consider if you could reduce the amount of meat your family eats and emphasize good cheeses and milk. Serve a few vegetarian dishes and a few more egg based meals. Egg choices at my Walmart aren’t so hot either (more on that next week), but at yours they may be better … I can easily see some regional variation here. Could you eat more bean and grain based dishes? How about skillet meals or casseroles that stretch your meat out? I’d try to limit this phase to only a few months at most though. 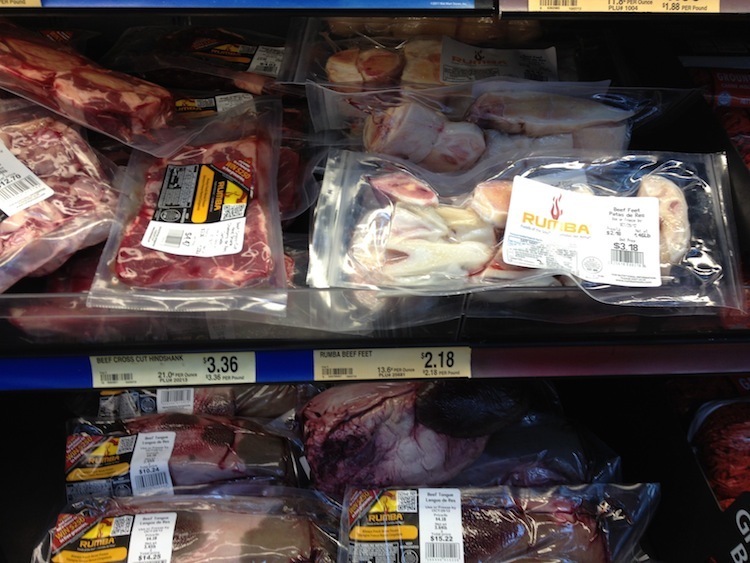 In the meantime I would brainstorm any other possible way you can get grassfed beef or lamb, pastured pork and chicken. I realize that for some of my readers this may be a daunting task. After all, this series assumes it’s not possible at all! But if it is possible for you, this is the second step, right after eliminating bad fats in priority in moving to a real food diet. Eating wholesome animal foods is hugely important to you and your families health. This will take some time and planning for many, I know it isn’t something that can be done overnight. My next series will be dealing with transitioning to local food and I hope those who find this difficult will find some help there. For now I’d just try to reduce eating conventional meat at whatever speed your family handles well.